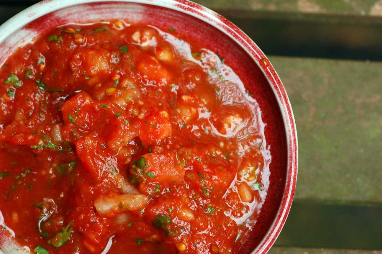 I love all things spicy, but the nice thing about making your own salsa is you can decide just how spicy you like to make it! With this great salsa, a touch of smoky chipotle pepper adds complexity to classic Southwestern salsa. Quick, easy and delicious. Enjoy the Canyon Ranch Spa experience at home! Place all ingredients in a blender container or bowl of a food processor and blend until smooth. Pour in a jar. Store covered in refrigerator up to 1 week. 2 Comments on "Canyon Ranch Spa Chipotle Salsa"
Ive never bothered to make my own salsa before (always been lazy and bought it in a jar) but this looks so nice I might just be tempted to give it a try. I can add a few jalapenos especially for me too as I like it a little bit hotter than the usual salsa. I hope you try this Canyon Ranch Spa Chipotle Salsa and let me know what you think . It&apos;s really yummy!!! Welcome to A Healthy Kitchen!